Nizhny Novgorod (or just Nizhny for short) is a city right next to the famous Volga river. There are many songs in Russian about Volga – the longest river in Europe. 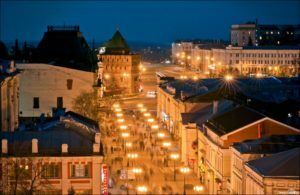 Nizhny is the 5th most populated city in Russia, right after Yekaterinburg. Moreover, that’s where Sweden will play against Korea (June 18th), Argentina against Croatia (June 21st), England against Panama (June 24th), and Switzerland against Costa Rica (June 27th). For more information about the match schedule, click here. 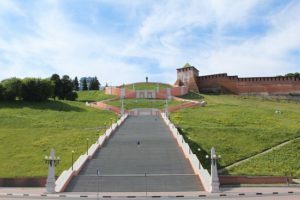 Traditionally we have prepared a list of the most interesting sightseeing places, things to do and tips to make your stay more memorable while you discover Nizhny Novgorod. Kremlin would be your starting point to explore the city. If you read our article about Moscow, you would have heard about Kremlin already. Nizhny Novgorod’s Kremlin is a historical place. It is the exact spot where Kuzma Minin and count Dmitry Pozharsky (there’s a monument dedicated to them in Moscow) defeated the Polish army. It was a truly legendary moment in Russian history and you can find out why when you book an excursion around Kremlin on your next visit. 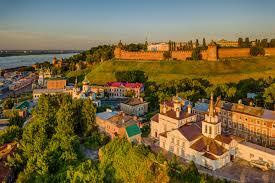 Nizny Novgorod’s Kremlin is one of the 14 Russian miracles, it is the only fortress that is included in the list. Another great reason to visit this place is to try to uncover the mystery of the “enchanted treasure of Russia” or in other words to find a hidden library of Ivan the Terrible. Apparently all his books are still hidden in one of the dungeons. Moreover, this Kremlin is unique as it consists of 13 towers, and its walls are two kilometers long. It is considered to be one of the best and strongest constructions of that time. It’s not only a historical sight, it’s also one of the best lookout points in the city. 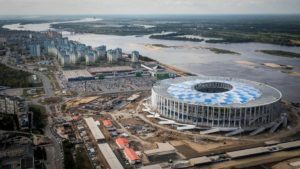 You will get to see the whole Nizhny, the meeting point of Oka and Volga rivers, the World Cup stadium, and even visit the beautiful Cathedral of Archangel Michael nearby. Also, while you’re there, you can go up and down the Chkalov Staircase that was named so after a famous Russian hero and test pilot Valery Chkalov. His monument is also there. Valery Chkalov was world-famous for the first ever non-stop transpolar flight from Moscow to the USA. Once you’re done climbing up and down the stairs, you can head down to Fedorovsky Embankment. It’s yet another beautiful place with lovely views. 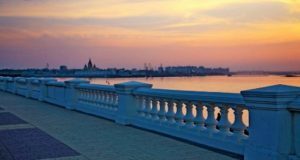 If you want to get even closer to the river, go further down to Nizhnevolzhskaya Embankment from where you can admire breathtaking sunrises and sunsets. You can also check out the Geroy Boat monument, and the Deer Sculpture. Geroy Boat (which means Hero Boat) is a monument dedicated to a famous boat that participated during the civil war in Russia (1917-1922), and even during WWII – specifically during the Battle of Stalingrad (1942-1943). This boat had a variety of powerful weapons installed on it, and it was a force to be reckon with. After two long wars, it still stood strong and unbeatable. 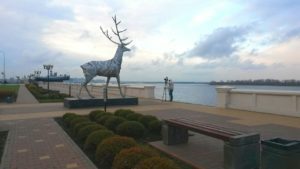 Deer Sculpture was a gift of Hungarian consul. Why a deer? Well, first of all because it’s a strong, noble, wise and graceful animal. Second of all, deer is a symbol of Nizny Novgorod, as depicted on the coat of arms. After you’re done admiring these two amazing sculptures, you can take a boat ride on the river. is full of shops, cafes, various tourist attractions, and what’s more – it’s a pedestrian street, so no cars are allowed. You’ll feel safe and relaxed there. There are also many souvenir stalls where you can find a variety of gifts. Besides, you will find many good restaurants along Bolshaya Pokrovskaya. You can easily spend a few hours to enjoy this street fully. It is a park with fun activities for both adults and small children. 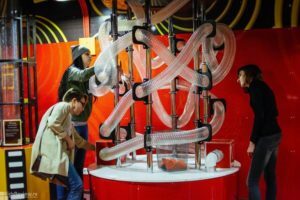 Illusion, magic, science, mirror labyrinth – all of that will leave you fascinated and intrigued. In addition, you can get into the role of a scientist, and carry out a few experiments yourself. So much fun! This is quite a unique art gallery that won’t leave you disappointed. It displays work of Russian artist Alexander Yurkov, who used natural resources ( like leaves, pine cones etc) in his paintings. 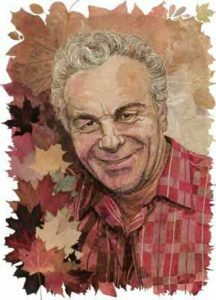 He also created a special technique that was named “floristic technique” where he only used various leaves and glue without any brush of paint. Nizhny Novgorod State Art Museum is one of the oldest museums in the world. The collections of art that are displayed there are the most complete and massive in their size. It gives visitors an opportunity to learn and understand the roots of national art of Russia, starting from ancient icons to contemporary works of art. Nizhny Novgorod State Art Museum stands out among others, so it’s definitely a place worth visiting. If you love nature, peace and quiet, you’ll enjoy Switzerland park. It’s a lovely place to take a long walk, admire the beautiful forest, enjoy some park attractions and see some of the rare animal species.Why is it called Switzerland Park? The natural beauty there, especially the forests, reminds people of landscapes in Switzerland, hence the name. It is dedicated to the Russian scientist Andrei Sakharov who was a very famous physicist and human rights activist. He was living in the very museum (he was exiled in that flat for six years). Sakharov was persecuted in the Soviet Union for his support of the civil rights reform; however, that also got him a Nobel Peace Prize. You will learn more about his fascinating life during the museum tour. 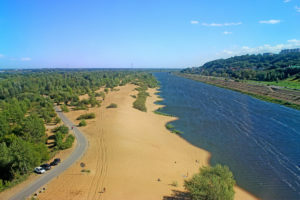 Dont forget your swimming costume if you planning a trip to Nizhny in summer as its beaches is a must-do thing. There are plenty of beaches where you can swim, tan, play volleyball and even have a barbecue. Here are some of them: beach on Grebnoi Kanal, beach on Schhelokvkiy Khutor, beach on Molitovskiy Zaton. You can find all kind of animal species there – mammals, birds, fish, amphibians, and many more. There are around 250 species, some of the them are endangered and under protection. You can also enjoy a variety of street food there. If you travel with kids, then they can have fun by feeding some animals there. To enjoy panoramic views over Nizhny Novgorod plan to visit Nizhny’s Cable Car. It is especially spectacular during sunset. 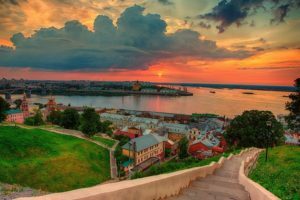 The cable car route is 3660 meters long, and it will take you from Niznhy Novgorod to the town of Bor across the Volga River. Bor is a quaint little town well worth exploring as well. 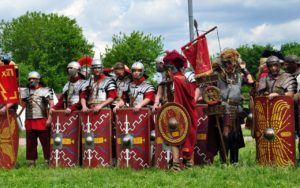 You will find beautiful temples and cathedrals as well as a military museum and Pax Romana (park of the living history) there. Pax Romana is a must visit place if you dare to turn into a knight, shoot an arrow, and even try to make a sword. It’s a very tranquil place with beautiful architecture. It is located quite far from the city center. It even has its own leaning tower, just like in the town of Pisa in Italy. 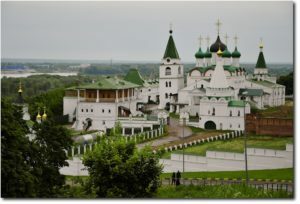 This monastery is a perfect place to start or end your exploring of Nizhny Novgorod. Remember that it’s a monastery, so you should dress appropriately (women should always cover their heads).